Looking for a way on how to rotate a video in Windows 10? The following blog post will teach you the possible ways on how to do that. After recording a fantastic video using Android device, iPhone, camcorder or any other video recording device when you moved the video into your computer and played it with default media player, you come to know that video is recorded in a wrong orientation. This is frustrating, isn’t it? In this situation, it is a good idea to rotate a video instead of rotating ahead to watch the video. In case, you’re running Windows 10 on your computer or laptop; then there are a couple of ways on how to rotate a video in Windows 10. In the upcoming lines, you’re going to read about two ways. 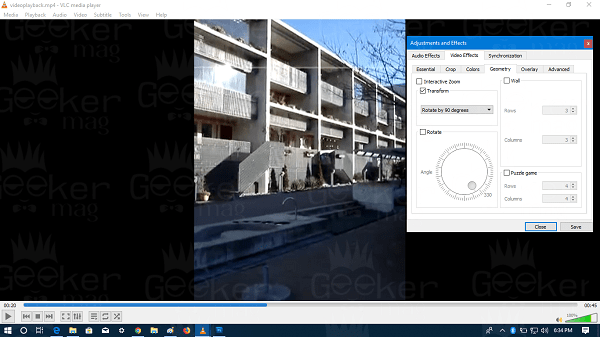 The first method will use the default video player app in Windows 10. In the second method will take help of VLC media player for rotating a video. To rotate the video using a Video player app in Windows 10. You need to make a right click on the video which you want to rotate. From the context menu select ‘Movies & TV’, the default video player application. This will open the video in Movies & TV app, this an intelligent application and when you stream the video using it, then it will change the orientation of the video automatically. But this method does not work in all the cases; then in this situation, you need to follow the steps mentioned in the next method. VLC Player is an advanced media player and comes with lots of advanced features which Windows Media Player and Windows 10 default video player lacks. 1. 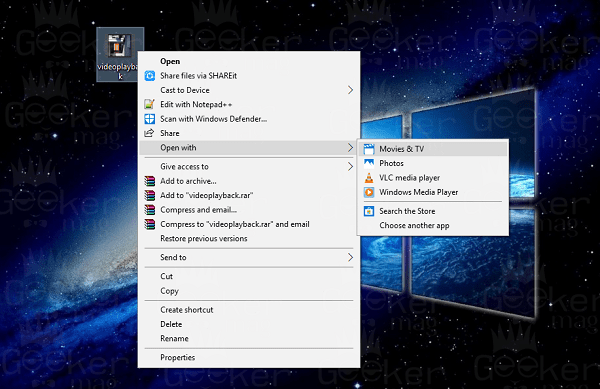 Download VLC Player using this link and Install into your Windows 10 machine. From the browser window navigate to the location of the video and select to open it. This will open the Adjustment and Effect windows. Here you need to switch to ‘Video Effects’ and under this switch to ‘Geometry‘ tab. Here tick mark the box for ‘Transform‘. Now using drop-down select the appropriate option which fixes the orientation of the video. Once done, click on the ‘Save‘ button. 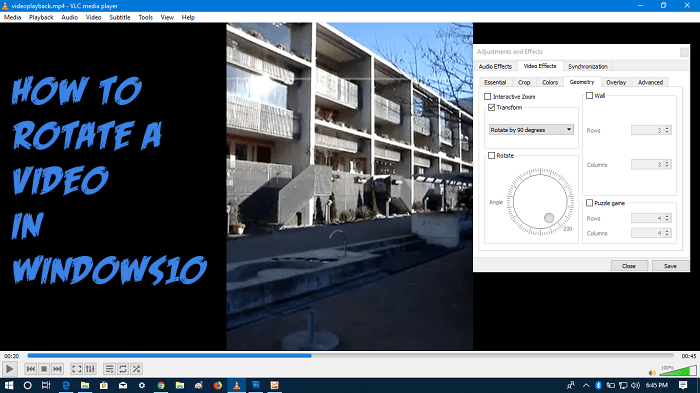 Is there any way on how to Rotate a video in Windows Media Player? No. Since Windows Media Player is a basic media player it lacks functionality using which you can fix the orientation of the video. Is it possible to rotate video using Window Movie Maker in 2018? Yes, the method to rotate a video using Windows Movie Maker probably working, but the company has officially stopped the development of the Windows Movie Maker. Officially there is no link available on the internet to download the program. In case, any third party program provides the same program, then it is not official and may contain malware or virus. So I do not recommend using it. 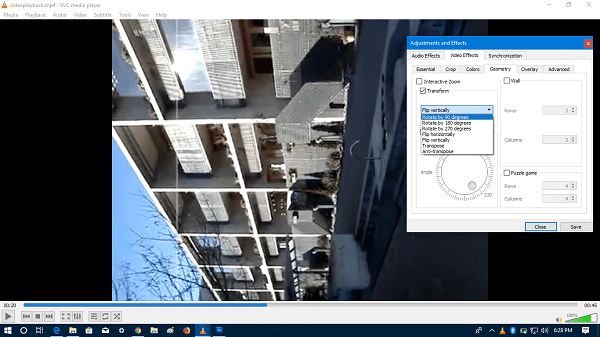 I hope you find my this blog post on how to rotate a video in Windows 10 useful. Let me know your thoughts in the comments.